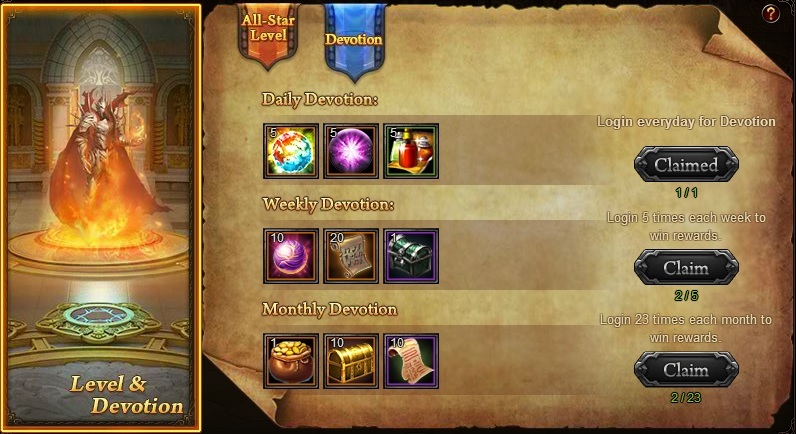 Weekly devotion resets on 1st day of the month. And shop still not refresh on given times if logged off. Its really nice to get some (unacceptable) answer after a few weeks, but (as u can check, i paid for that, so would be nice to use them. As i reported the bug (first time on Forum), wasnt available. Fixed, got nothing for reporting. Couldnt find anywhere how many stamina needed for it. Im not on the top, but has like 200.000.000 useless wisdom, 50.000 useless magic crystal, 165.000 points in Team Dungeon, etc. The 1st issue about the all star shop being unable to refresh, this is already logged and sent to the devs are waiting for updates as well about this issue. For the other issues, during the update they were all taken care of and were given given compensation to rectify for the losses. Do u think its fair or good for ur business??? Stamina use on Domain Exploration is intended as it also have a chance to reward you with greater stamina pill. Compensation for camp wars was kinda low i agree however its better to get something than nothing. As i see from the 3rd tournament even the high lvl cashers leaving aswell, like everyone from my server after merge. Maybe cause they get bored about the same sh1ts??? 2019-4-21 16:56 GMT+8 , Processed in 0.062499 second(s), 46 queries .